Led by our Ministers, Music Director and our Choir, this service is a night of stark beauty in the darkness. 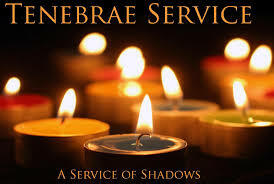 Tenebrae is Latin for shadows and tells the story of the increasing isolation of Jesus and of all those who suffer. Tenebrae is a service of mourning, of remembering the loss, grief and suffering of this old world. Though in our worship we often counter the litany of suffering with stories of love and joy, Tenebrae is a time to be with your broken heart, be in community, be a part of all that is. Held on Good Friday, this service will touch upon Tenebrae and Good Friday themes. Join us for a candle-lit night of readings, music and the rare opportunity to use our church’s communion silver, borrowed back from the Museum of Fine Arts in Boston. The adult choir will sing excerpts from Mendelssohn’s “Elijah.” The First Parish Quartet (Carol Krusemark, Laura Kalb, Buffie Groves and Larry Herz) will also be singing and Carol Krusemark will sing Barber’s haunting “The Crucifixion.” Carol Epple – flute, Elizabeth Connors – clarinet and Nathan Kimball – cello will be joining Steve Sussman on piano and Robert Noble on organ to accompany the music during the service. Combining tradition with a touch of unconventionality, this will be a service of shadows and deep reflection.